Local chat is currently unavailable. Do you have a research question? 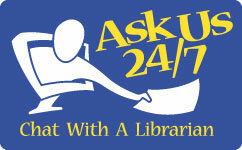 Chat with a Librarian through AskUs 24/7! Adaptive technology, building accessibility, parking, and key contacts. Resources and services for Syracuse University alumni. A campus-based experiential entrepreneurship program offering coaching, ideation, and venture creation support. A wide selection of technology that can be borrowed for personal use. Renewals, recalls, overdue fines, book checkout and return, borrowing privileges, computer access, and library access at other institutions. Access to materials that have been designated by faculty as required reading for specific courses. Library to Go Campus delivery, Articles to Go electronic delivery, requesting from The Facility, Hawkins Building storage, and Nancy Cantor Warehouse services. Phone and Texting service for users of Bird Library. Arranging instructional support for faculty and teaching assistants, help and how-to guides, research starting points, and scheduling a class. Interlibrary Loan and Document Delivery Service will obtain needed materials that are not available in Syracuse University Libraries. Supports student achievement and success through a variety of services, spaces, resources, and partnerships. Services including open-access, public access, author rights, copyright, and SURFACE. Consultation and instruction for authors and researchers, including research data collection and management. Research assistance available via chat, text, email, phone, or in person. Chat service available 24/7. All service and library request forms for circulation and course-related services, delivery services, news and exhibitions requests, remote access, distance learning services, spaces requests, and special collections forms. In-person technology assistance, library technology assistance from the Answers knowledge base, and loaner technology. My Library and Interlibrary Loan accounts.